Particularly in the field of cosmetics and detergents, manufacturers are looking for new surfactants, which are environmentally friendly and biocompatible, and in addition gentle and sensitive in perso- nal care. The choline compounds, developed by the University of Regensburg, exhibit excellent surfactant properties, especially concerning water hardness insensitivity and beneficial features for skin care. So far, fatty acids mainly up to a chain length of C12 were used for the production of surfactants. Since the investigated choline surfactants are highly soluble in water, also longer chain fatty acids can be employed. Therefore, a broad range of renewable raw materials like palm oil, which consists of 44% of palmitic acid (C16), is accessible. Thereby, conventional manufacturing processes can still be applied. 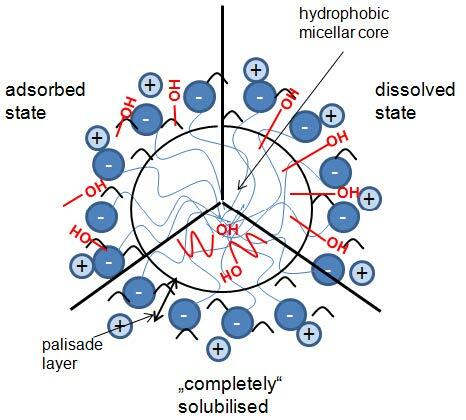 The present inventon shows how a new promising green and highly watersoluble sufactant can be designed based on recent progress in the knowledge of counterion-headgroup binding and crystallization behavior. The result is the combination of a most classical surfactant anion, dodecylsulfate (DS), with choline (Ch), a natural green cation. The advantage of the physiological metabolite choline is its bulky structure that prevents ChDS from easy crystallization and thus leads to a considerable lowering of the Krafftpoint down to 0°C. The present choline compounds are ready for the usage as anionic surfactant in personal care and household cleaning products. Alternative to the common sodium dodecyl sulfate (SDS) and to conven- tional ethoxylated anionic surfactants like sodium laureth sulfate (LES). Feasible application in degreasing, emulsifying, controlling viscosity, gelling, dispersing, solubilising and lubricating in technical and medical processes and products. Figure 1: Schematic illustration of possible alcohol binding sites, respectively solubilization mechanism, for alcohol with varying chain length. Proof of Concept. Ready to use.